ECFC Video on Disability and Football. Once again we’re extremely grateful to Exeter City FC for allowing us to have a bucket collection at the Lincoln City match on 1st September, 2018. For several seasons now this has helped us greatly in boosting our funds towards improving facilities at St James Park for supporters with disabilities. This season alone we’re supporting a number of projects around St James Park including End of Seat Hand Rails for the IP Office stand, TV screens for the new stand to assist those who cannot hear the tannoy announcements, equipment for the new Changing Places Room and Safety Netting to protect those in the accessible bays at the front of the Big Bank stand from flying balls when players are warming up before games. We’ll be handing Exeter City FC £4,000 or more this season alone and we’re only able to hand this amount over due to years of fundraising through Christmas draws and collections. We’ve still been doing stuff for the club over the years but we’ve also been saving to allow us to help with bigger amounts when called upon. Christmas Draw 2018 – Are You Able to Donate a Prize? We know it’s only September but we will be holding our Christmas Draw again this season and are on the hunt for prizes. We would very much like to hear from anyone able or willing to help by donating a prize. If you are, please email: ecfcdsa@gmail.com or telephone Nick on 07913 256697 – thank you. Like the Terminator, Nick Saunders is back as our chairman and the following is all those on the committee. David Jones (vice-chair and membership), Sue Harwood (secretary), Trevor Harwood (treasurer), Jeanne Jones, Martin Robertson and Lee Holmes (president). We are working on recruiting 100 members this season as this has always been our hope since our DSA was formed back in 2007. Membership is available for only £5.00 per season and this ensures our members are included in the ECFC Priority Group database for tickets etc. Membership is open to everyone and not just to those with disabilities. If you would like to join us please download a membership form from our Join Us webpage. Please come and join us and help us greatly in reaching our 100 members target. To help with accessibility and safety, both the IP Office Stand and the new Stagecoach Family Stand have been fitted with new and improved end of seat hand rails, this followed a successful trial in the IP Office stand last season. 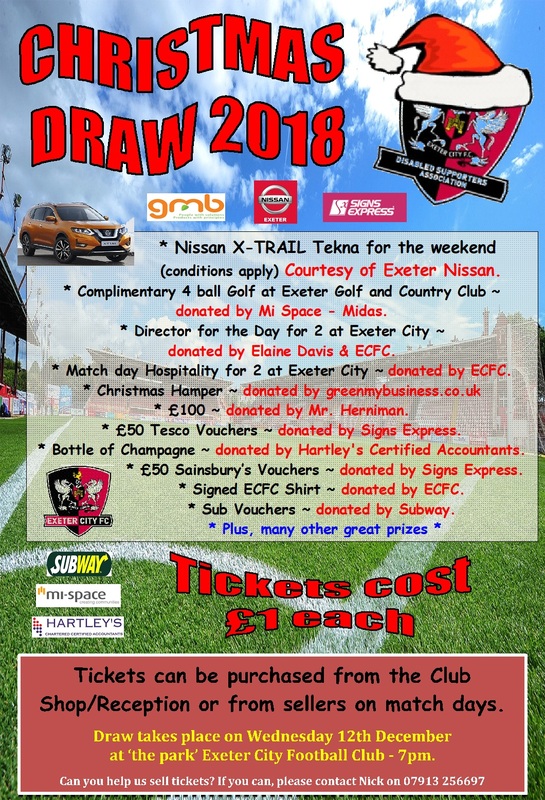 This has been made possible thanks to supporter groups including the Exeter City Disabled Supporters Association (ECDSA), who donated £1,000 to this cause. 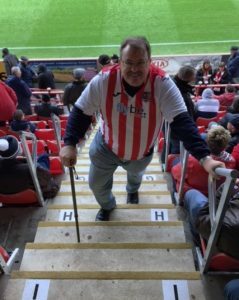 Martin Robertson (pictured) said ‘I have difficulty getting to my seat near the top of the IP Office Stand because of mobility and balance problems but these hand rails will make a huge difference in giving me support, confidence and increased safety when I go up and down the steps’. The hand rails were in place for the Cheltenham Town game on 22nd September and are ergonomically shaped to help with grip. Nick Saunders (ECDSA Chairman) said ‘the new hand rails are a big step forward in improving accessibility and safety to the stands and it’s pleasing that ECDSA has been able to support such a worthwhile improvement thanks to the generosity of the club’s supporters and other supporter groups’. To date we’ve raised over £21,000 since forming in 2007 and have donated over £12,000 towards many projects at Exeter City FC for the benefit of those with disabilities, which adds better facilities for a better match day experience. It’s Christmas draw time again after a break last season and as you can see we’ve some fantastic prizes to be won and we thank all the companies who have donated a prize for their kindness and support of ECDSA. 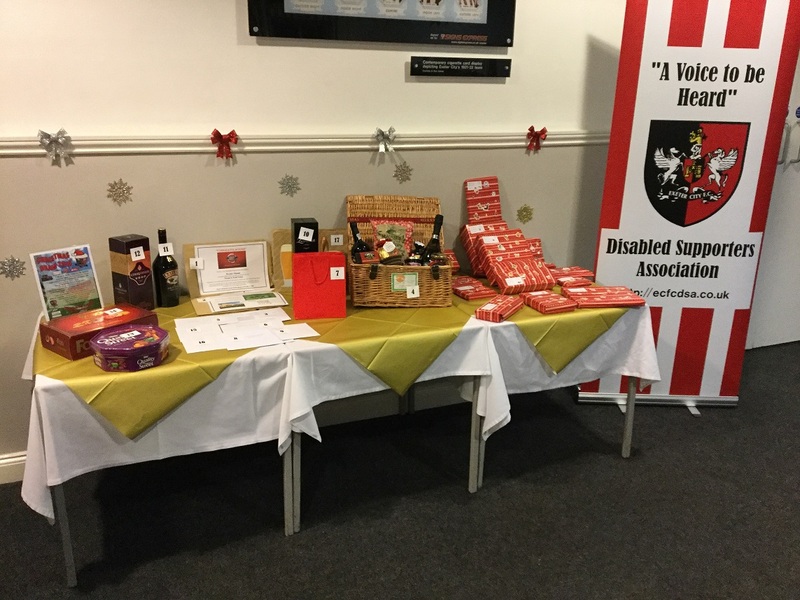 Our Christmas draw’s are our main fundraiser and all funds raised helps us to help Exeter City FC to improve facilities for those with disabilities which makes for a better match day experience. If anyone can help us in selling tickets please let us know as we’ve only 2000 tickets to sell before draw night on Wednesday 12th December. If members want to buy tickets on match days please look out for our sellers around Red Square and in the Centre Spot and the chairman will be in the new stand in the front row, block D, just stop them and they will gladly sell you some tickets. If not, to make things easier for those who would like to buy tickets please send money for draw tickets to us, address to send tickets can be found at http://ecfcdsa.co.uk/contact-us and we’ll fill out tickets to the amount sent to us with your details (please include Name/email/contact number when sending money) and once done we’ll email you your ticket numbers for your records. As the Disabled Supporters Association (ECDSA) exceed 100 members chairman Nick Saunders says “this is a huge achievement for our association and a significant milestone which we’ve hoped for since our formation back in 2007”. 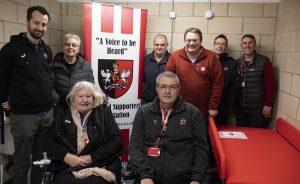 Committee member Martin Robertson has led a membership recruitment drive this season to further enhance the awareness of the Disabled Supporters Association through its supporters, club and players. Martin said “everyone here is passionate about providing a really good match day experience for all supporters with disabilities and by increasing membership and undertaking fund raising initiatives such as the Christmas draw, we hope to be able to provide funds to make St James’ Park wholly accessible to home and away fans and have accessible facilities that we can all be very proud of”. ECDSA has already contributed significant funds this season to help with the end of seat hand rails in the IP Office Stand and providing accessible equipment for the new ‘changing places room’ in the Stagecoach Adam Stansfield Stand (more news on this shortly). Nick said “there’s still lots to do like improved access to the club shop and other areas at the club but all is looking great with the new build which we’ve had our input on. All this has only been possible with a great Club and DSA working relationship and understanding on both sides”. 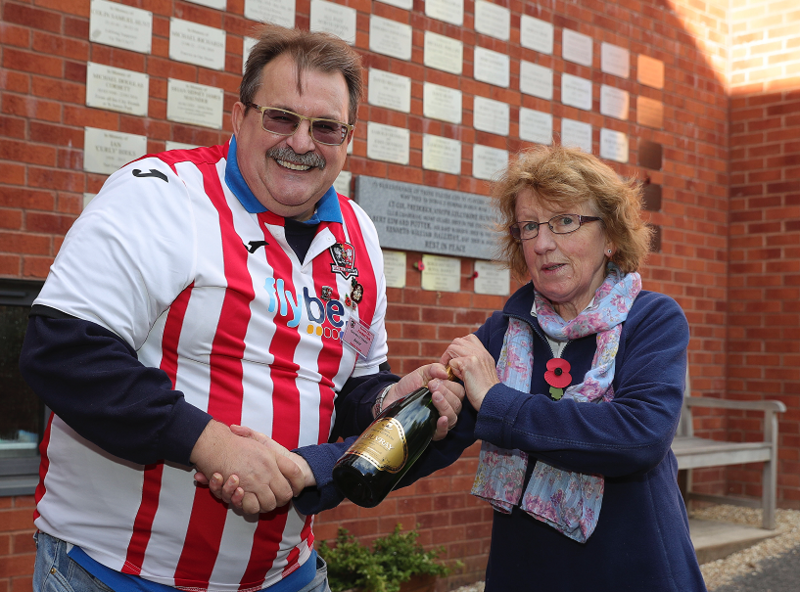 Membership is now heading towards 150 members but before that Martin took time out to present Christine Jenkinson with a bottle of wine in recognition on becoming the association’s 100th member for the first time in a season. Exeter City’s Changing Places facility in the Stagecoach Adam Stansfield Stand has officially been opened on the EFL’s Day of Disabilities. On Monday, December 3 saw the EFL host the first ever Day of Disabilities, which puts the spotlight on the work clubs do in the ever-expanding area of disability football and making football accessible to all supporters. The new changing places room in the Stagecoach Adam Stansfield Stand was part of the £3.5 million redevelopment at St James Park, which was completed in October 2018. Changing Places toilets are larger than a standard accessible toilet and include a height-adjustable bench, a hoist and room for a wheelchair and up to two cares. Standard accessible toilets do not meet the needs of all people with a disability. People with profound and multiple learning disabilities, as well as people with other physical disabilities such as spinal injuries, muscular dystrophy and multiple sclerosis often need extra equipment and space to allow them to use the toilets safely and comfortably. These needs are met by Changing Places toilets. Although the new facility is housed in the Stagecoach Adam Stansfield Stand it is open to all home and away supporters. 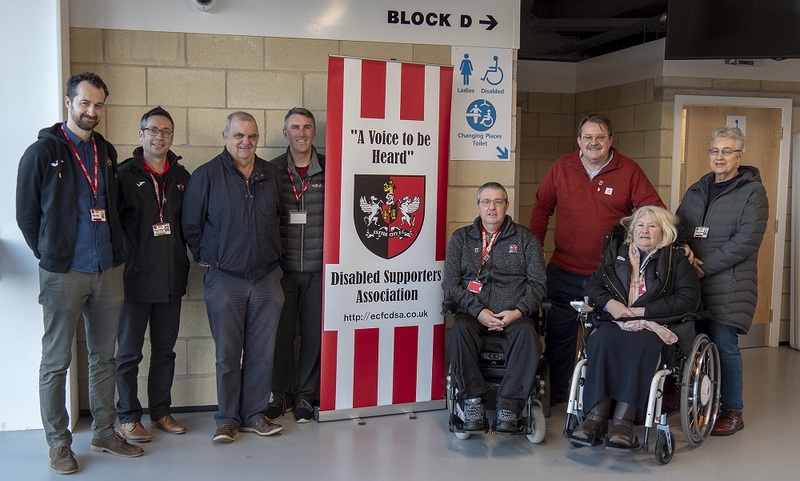 The changing places facility has been a collaboration between the club and the Exeter City Disabled Supporters Association. The ECDSA raised £3000 which has paid for the bench, hoist and privacy screen. The funds were raised through their Christmas draws and bucket collections. Nick Saunders, ECDSA chairman said: “We at ECDSA strive to ensure access for all. The Changing Places room is a good chance to make an improvement that has been missing. Justin Quick, Exeter City’s general manager said: “Exeter City Football Club is constantly striving to move forward and improve the facilities for all supporters. This season the EFL have published a new set of Disabled Facilities Guides for supporters of all 72 league clubs – every season there is a new set of guidelines produced. Over the last couple of months’, a group of volunteer ticket sellers, led by Committee Member Martin Robertson, have been busy persuading supporters and the good people of Exeter and beyond to part with a little bit of their hard-earned cash in exchange for a Christmas Draw raffle ticket. Again, for this year’s Christmas Draw (which is held every two years) we are extremely grateful to all those who so kindly donated prizes for the draw including: – Exeter Nissan, Mi Space – Midas, GreenMyBusiness, Subway of Sidwell Street, Mr D Herniman, Signs Express, Hartley’s Certified Accountants, Elaine Davis & ECFC and ECDSA Committee Members, together with everyone who sold and purchased draw tickets. 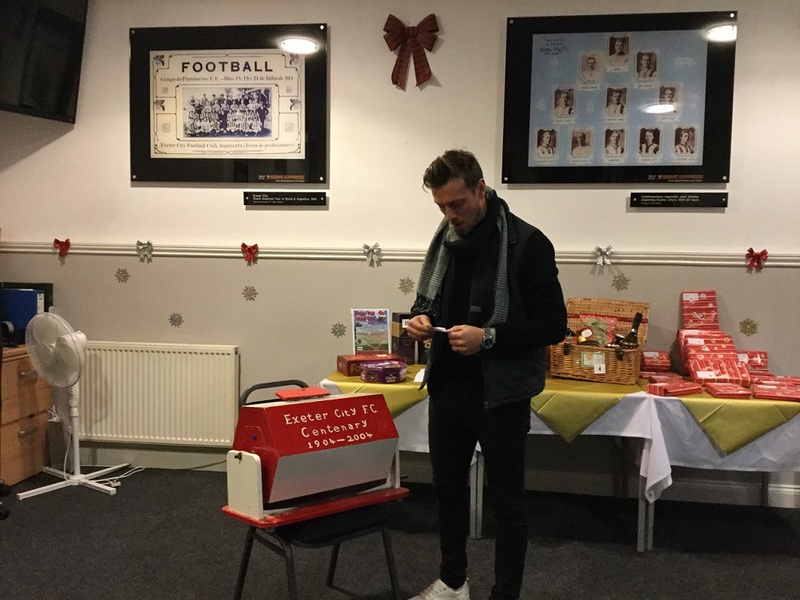 The draw took place on Wednesday, December 12th at 7pm at the Park and was attended by City player & ECDSA President – Lee Holmes, together with Russell Lemon from Exeter Nissan who both helped to draw the lucky winning tickets. All in all, there were 31 prizes up for grabs. We are pleased to announce that £1,671.56 was raised and this will be used to help improve facilities at St James’ Park for supporters with disabilities. 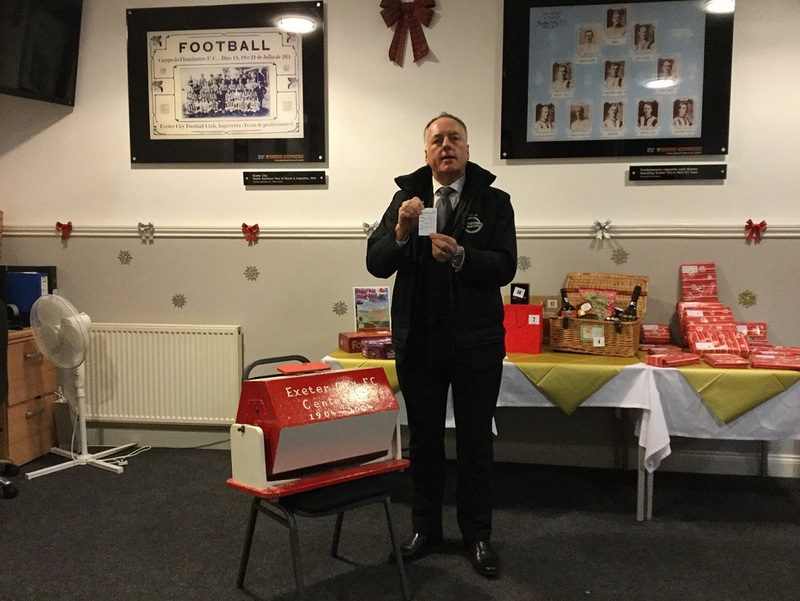 ECDSA chairman Nick Saunders said ‘the bi-annual Christmas draw is a major fundraiser for us, but without the support of local business and individuals we could not achieve as much as we do in helping to make the match day experience at Exeter City so much better for all supporters with disabilities – thank you all so much for your generosity and support of our DSA’. For more information about what we do, please visit http://ecfcdsa.co.uk – Membership available for just £5.00 per season. We are an ECFC Priority Group for tickets etc. Nissan ‘X-Trail Tekna for the Weekend’ (donated by Exeter Nissan) – J Thorne. 4 ball golf at Exeter Golf and Country Club – Voucher (donated by Mi Space – Midas) – S Rickard. ‘Director for the Day’ for 2 at Exeter City FC (donated by Elaine Davis, ECFC Director) – A Mogleston. £100 (donated by Mr D Herniman) – M Robertson. Bottle of champagne (donated by Hartley’s Certified Accountants) – T Lander. Tin of biscuits (donated by Mr & Mrs Harwood) – L Burch. NOW TV Stick with 2 months Sky Cinema (donated by Mr & Mrs Saunders) – K Edwards. 4 ball golf at East Devon Golf Club – Voucher (Mr & Mrs Burch) – R Saggers.